iFly Six Four Seven: The City of Destiny to the Garden City! After booking my outbound ticket to attend the annual Pharmacist's congress, I started off my search for my return ticket. 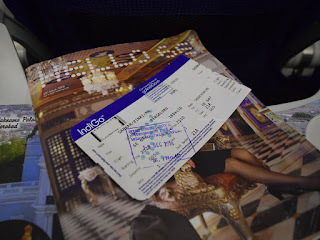 My requirement was a late evening flight - IndiGo 647 fit my bill to the T. Without much thoughts, I headed to the IndiGo website, and booked a ticket. I applied a discount voucher I had, and pocketed a fairly good discount on my booking. I did an online seat selection, and the integrated travel document was delivered to my mailbox shortly afterwards. It was a tiring day at the congress. The day wrapped up with my students winning a prize for their dance performance at the cultural performance. We ended the campaign on a happy note - there was a little bit of disappointment since we expected some prizes in the scientific sessions as well - but that didn't happen. I left the venue a little early to complete some shopping that I had to do. I had checked out of my room earlier in the morning - so just headed to the hotel and picked up my luggage from the bell desk and moved it to the Ola cab that was waiting for me. The highway was a little chocked. I reached the airport around 1851 hours - more than two hours before my flight. Waiting for baggage screening to open.. I entered the terminal building and found a place to rest. Baggage scanning was yet to begin - the check-in counters were yet to open as well. The waiting area seemed quite crowded - no less than 4 flights were opening in the next 30 minutes or so. 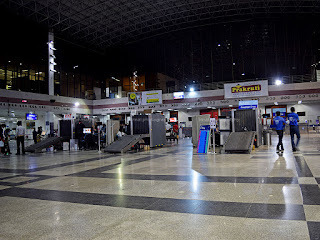 The baggage screening counter came alive around 1915hrs, and I was the first in line. I got my bag screened by 1917, and headed to the check-in counters, which was just opening then. The agent quickly checked in my bag and issued a boarding card by 1919hr. Security check was deserted, and I was done by 1923hrs. The security hold was crowded - just a few seats vacant here and there. The departures FIDS.. The one on top is my flight.. I spent the rest of my time doing two things - watching a movie on my phone, and tracking the incoming aircraft on FR24. VT-IFG, Airbus A320-232 with line number 5411, delivered to IndiGo in December 2012 was on its way from Bengaluru to take me back home. I missed a sharklet equipped aircraft by one registration. 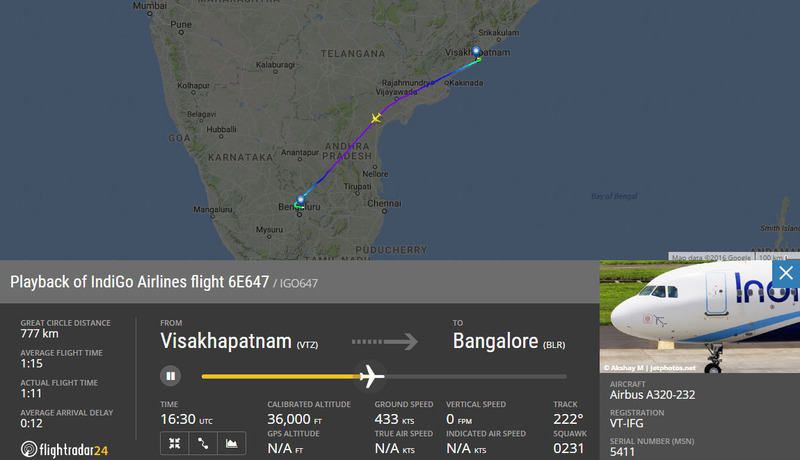 The inbound aircraft came in at 2046hrs. By now the security hold was a big mess - two flights to Bengaluru were delayed (one of them had just left), and another 3 flights were scheduled. The small security hold was packed with passengers departing by 5 different flights - 2 turboprops and 3 A320s - somewhere around 650, or so, passengers! And, to make matters worse, all the flights were boarding from the same gate! Soon after the aircraft landed, pre-boarding announcements were made. 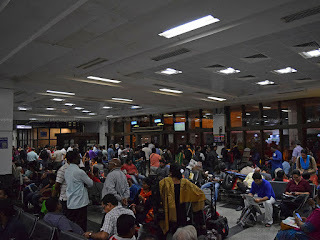 I was tired sitting, and decided to queue up, even before boarding was called, in true desi fashion. Gate 1 had two sub-gates - rather, two boarding desks, each of which could be used as a gate itself. 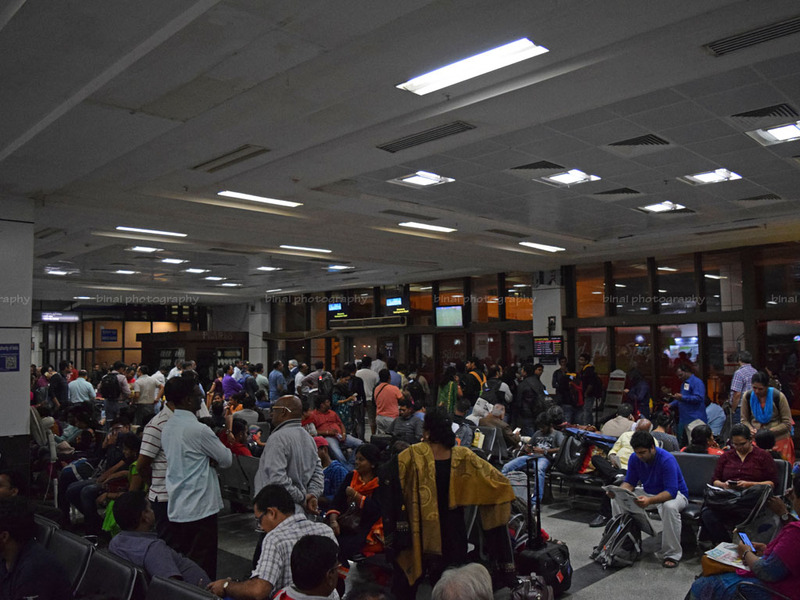 Staffers from Indigo and SpiceJet were fighting, albeit in a friendly way, about who gets to use the gate. 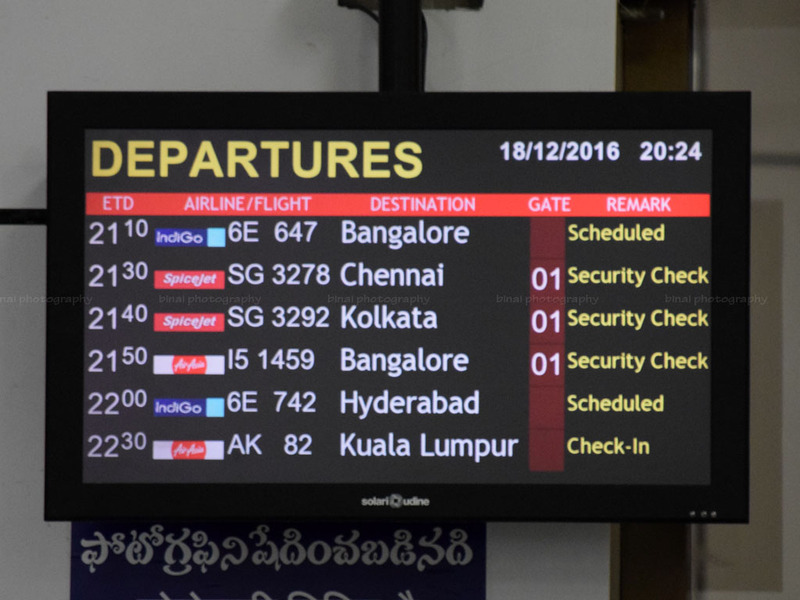 Both the airlines had flights departing in the next 30 minutes, and both were allotted the same gate. 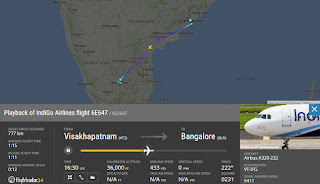 While the aircraft for my flight had already landed, the aircraft of SpiceJet was yet to land. Finally, a boarding call was made at 2056hrs. I was at the front end of the queue already, and was the first guest to board. My boarding pass strikes a pose with Hello 6E, the inflight shopping catalogue..
A Casual chat with the check-in agent confirmed that were had good loads - 176 booked, 174 checked-in. 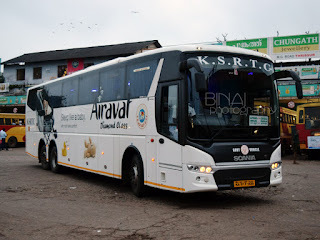 Although the aircraft was parked at a bay quite close to the terminal building, bus boarding was used. 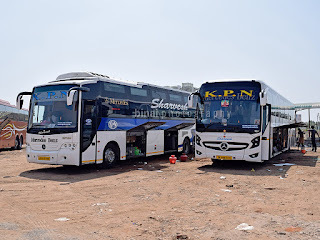 Quite unusually, the did wait for the bus to be packed either - the bus started moving towards the aircraft as soon as the seats were filled and about 10 passengers were standing. We got to the aircraft by about 2101hrs. 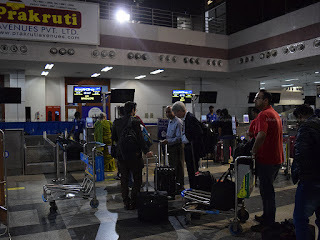 It was exactly 15 minutes since the bird landed at Visakhapatnam - as the bus stopped, IndiGo's housekeeping men were walking out of the bird - a very impressive turn-around. We had to wait for a couple of minutes before the crew confirmed that the cabin was ready for boarding. I walked into an uber clean aircraft by 2105hrs, warmly welcomed by the cabin crew at the entry. Boarding was real quick - people were brought in small batches and they managed to complete board by 2111hrs. Doors were armed by 2115hrs and we were pushed back by 2117hrs. Welcome announcements were made as we were being pushed back - in command of the flight was Capt Sanjay Rathore and First officer Vinod Nikam. The safety demonstration was rushed through as we prepared for taxi. The captain also announced that we would have a very short taxi, since the apron is located towards the end of Runway 10, which would be used for take off. We commenced taxi at 2124hrs. We were on the active runway a minute later, and we finally took off to the east, by around 2127hrs. We flew straight to the sea, before turning around to the land, and setting cruise to the South West. The flight path was right above the hotel I was put-up in Vizag for the past three days - and I did spot my hotel as we climbed out of Vizag. The seatbelt sign was turned off at 2131hrs - four minutes after we took off. The food trolleys came out soon after the seatbelt sign was turned off. Since some time, Indigo has been using three trolleys to serve passengers - one for every ten rows. 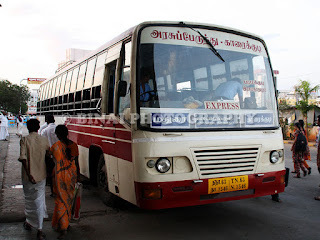 Since I was on 21A, there was one trolley starting from there - and needless to say, I was the first to be served, since I also had pre-reserved a meal. I had selected my meal from the menu card well in advance. The menu card was a surprise for me - a lot of interesting stuff were missing from the card. 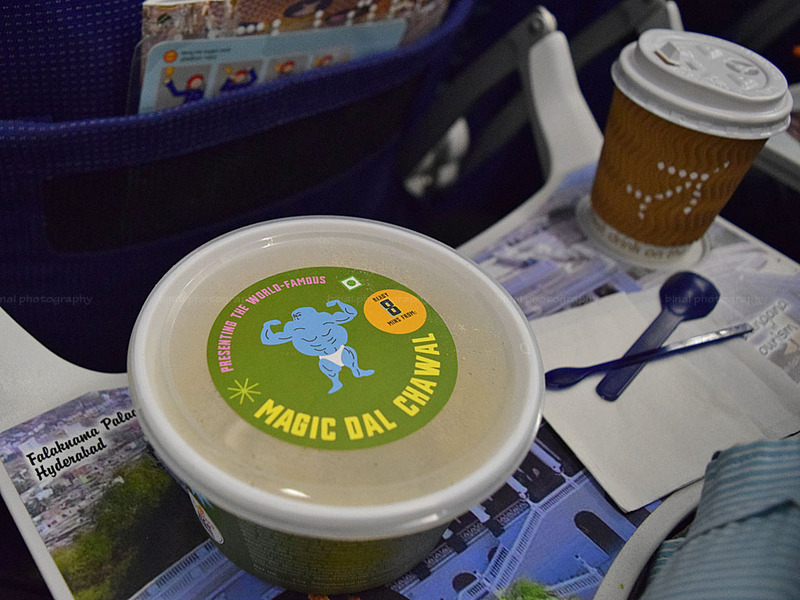 Only Dal Chawal, Upma and the Cup Noodles were available in the hot meal option. I hadn't tried the ready in 3/5/8 minute hot meals on Indigo - they are available only on sectors longer than 60 minutes, and my regular BLR-COK flights don't have them. I wanted to use this as the opportunity to try them. 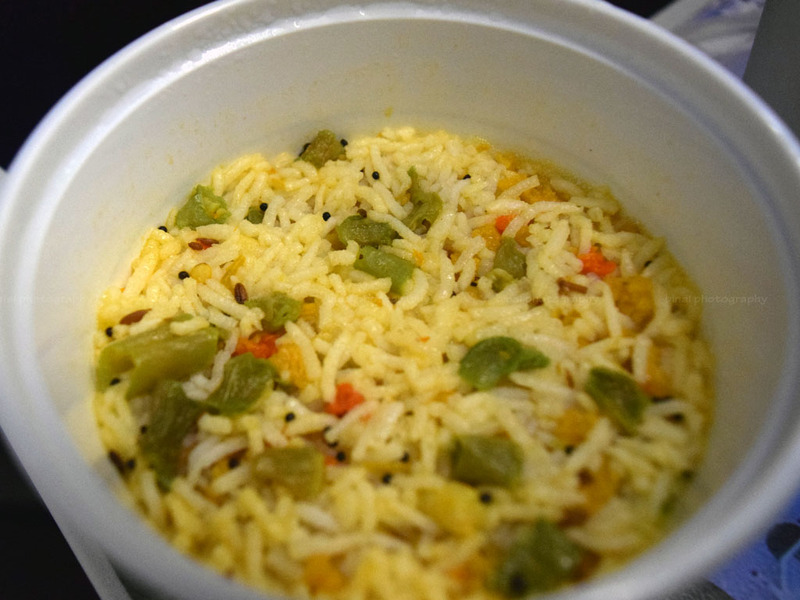 "Magic Dal Chawal" from the IndiMeal menu.. I opted for a Dal Chawal this time. I badly wanted something hot to drink, and opted for a Masala Chai instead of the usual juice options. 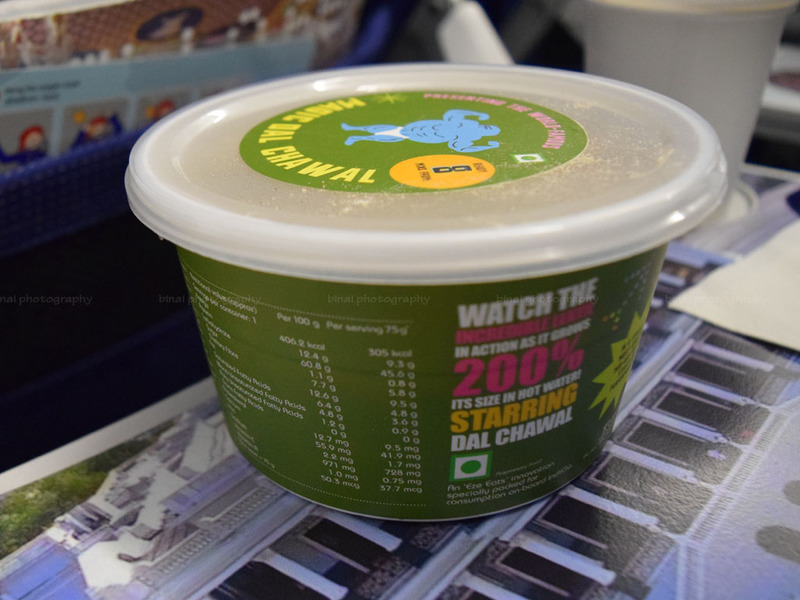 The FA added water, closed the lid of the Dal Chawal and handed over with an instruction to open it after 8 minutes. The Chai was ready to drink as she handed over. Tea was served in a fluted paper cup, with a cap. IndiGo uses a Girnar Instant Premix Tea with Masala on board - this was also conveyed to me before the tea was prepared - that was a nice touch to keep the guest updated on what brand of tea was used. The Masala used in the tea had a very strong flavour, made of Cloves, Nutmeg, Black Pepper, Ginger, Cinnamon & Cardamom (ingredients as mentioned on the Girnar website). I sipped on the hot tea while I counted the 8 minutes needed for my Dal Chawal to be ready. I opened the container with a little bit of hesitation - anxious of what is looks like, and what it tastes like. As I opened the container, I saw long grain basmati rice, with lentils and veggies (carrot and french beans). The entire contents remained below half the height of the container. The was well cooked, tasted quite nice - neither too spicy, nor bland. I enjoyed the meal completely, and washed down the meal with whatever tea remained. My fluted paper cup with the Hottest Drink on the Coolest Airline - Girnar Masala Tea.. The Dal Chawal.. aka Rice in lentil soup with veggies.. I took my sweet time to complete the meal. There was a round of thrash clearance half way into the flight, and I disposed off my thrash during that round. I caught up with some sleep for a while. The seatbelt signs were back on at 2224hrs. I guessed that we'd be landing on Rwy09 going by the approach, and I was quite right at that. We touched down on Rwy09 at 2238hrs. We finally docked at stand #13 by 2242hrs. Deboarding was only through the front exit. I got off the aircraft by 2249hrs. I had actually thought the aircraft would be parked for the night, but the new found series of red-eyes from IndiGo meant the aircraft was heading out again, and she was headed to Goa! The crowd at the boarding gate seemed good - probably a fairly full flight at such an odd hour as well! It took a very long time to deliver the checked in baggage - which turned up only at 2302hrs. I was too tired to think of taking a bus, and headed straight to the App Taxi pick-up point, into a waiting Ola! This was my ninth flight with Indigo. I always loved the cleanliness on Indigo, and the way they maintain their aircrafts. The interiors are always standard - Recaro Slimline seats, that liberate a lot of leg room and standardised signages irrespective of age of aircraft. There are a few things that I often dislike on IndiGo - the number of hurried announcements they make, the limited range of onboard meals and the mechanical service put up by their crew. However, the last few flights with them have been generally nice - had a few flights with warm crew who put up a smile while serving. Although the menu was quite limited, I quite liked the meal I had this time. 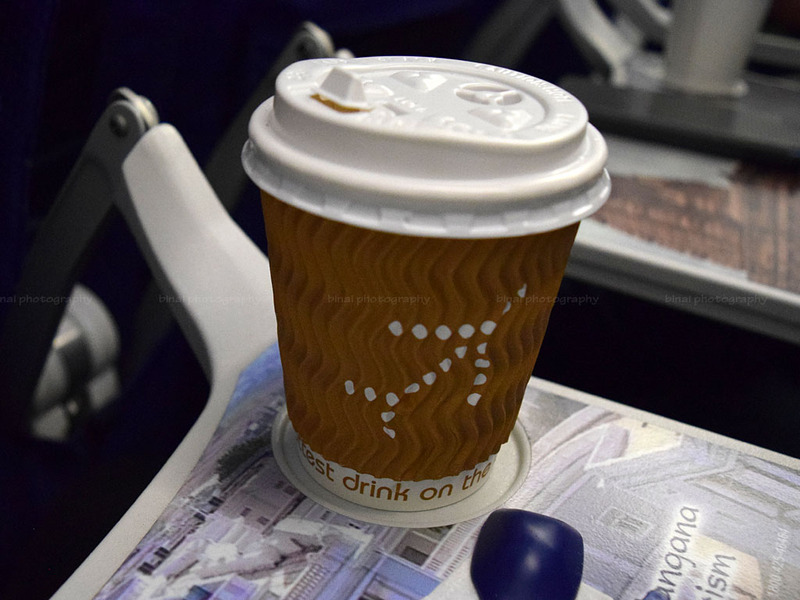 The Chai was surprise for me - it tasted really good, and will surely remain high on my choice during the next flight with Indigo. A great flight to wrap up 2016!